Warmington resident Jane Sollis woke up one morning with a shipping container in her back garden.Mrs Sollis contacted the local council for help, but it is actually the landowner's responsibility to remove anything dumped on their property.The National Fly-Tipping Prevention Group recommends you get in touch with your local council or the Environment Agency for help. What help can I expect? Your council will take some bulkier waste items for you, for a fee of about ?25, but are strict on what they won't take away for you. Different councils have different rules and rates, but shipping containers don't tend to feature on the collection list. Blacklisted items include sheds, toilets and pianos.So if your dumped waste falls between the cracks - too big for the council but too small for the EA - you may have to get creative.Mrs Sollis took the creative approach.After contacting the police and her local council, in the end she decided to put it up for auction on eBay instead. The successful bidder took it away on Friday and she made ?200. How often are fly-tippers caught? Councils may not take away your rubbish for free, but they may investigate and dish out fines of up to ?400 if perpetrators are caught. In some cases, councils can prosecute fly-tippers. A Birmingham man was jailed for two-and-a-half years in August for making a business out of illegally dumping rubbish.Andrew Smithson, from Perry Barr, dumped furniture, carpets and domestic builders' waste on residential streets for three years. 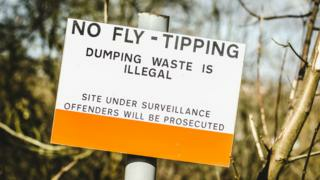 You may even be able to claim back your disposal costs if a prosecution is successful.There were 1,571 fly-tipping prosecutions brought by English councils in 2016-17 - a significant decrease of 25% from the previous year.However, this figure does not include an increase in fines for smaller-scale offences. There were 56,000 fines for fly-tipping last year. Who pays to clean up the mess? In general, the bill for fly-tipping tends to be picked up by the victim.In October, George Winn-Darley from Buttercrambe in North Yorkshire spent ?800 clearing rubbish dumped on his land- and it took him and a team of workers 46 hours to remove the two trailer-loads of waste. "It is more expensive for the victim to remove the fly-tipped waste from private land than the cost of the fixed penalty notice," he said.Mr Winn-Darley wants the maximum fine for anyone caught to be increased. "Fly-tipping is not a victimless crime," president of the Country and Land Business Association (CLA) Tim Breitmeyer told the BBC. Mr Breitmeyer said landowners were "clearing away other people's mess and paying for the privilege". "We need to see tougher penalties," he added. What if it's not rubbish and it's... a horse? The dumped horse left the girl's grandmother "very shocked"
A grandmother was left "very shocked" when a horse was dumped in her back garden in Stoke-on-Trent in April.The horse, known as Mr Melvin Andrews, was dumped there after her teenage granddaughter responded to an advert online saying if no-one took him, he would be put down.This one is less a case for local authorities or the Environment Agency, more one for the RSPCA.The charity has warned that horses are regularly being fly-tipped and left to die when they become too expensive to care for, with almost 1,000 being rescued by the charity in 2017.The horse, called Mr Melvin Andrews, was removed from the garden and is now recovering at a farm rescue centre in Blackpool. » Reality Check: Are ships more polluting than Germany?